I made this popcorn for a tv viewing night with my friend Laura. We were both addicted to the reality tv show Married At First Sight which is true car crash tv. And before you judge me many, many people were taken in by it (including visiting American writer Roxane Gay!). Even the mother of the baby at the christening Laura was at wanted to rush off to watch it. Over the last few months while we were watching it Laura and I would text each other. We both had our favourites and least favourites and for the most part they were the same people. We'd find each other outraged at the same things and sometimes our messages would mirror each others, sent within seconds of each other. When the finale rolled around, we decided that we needed to watch it together. We had MAFS themed food (pizza for pizza toast, Nutella from a jar and cupcakes) but I also made this popcorn for viewing purposes. We also decided that we should order some regular food as well as having pizza because whenever we get together, the food that results is a little crazy. Laura ordered some fried chicken and I ordered a poke bowl because that was what we felt like eating. We were both wearing pyjamas and all of our deliveries arrived within minutes of each other. We lay all our food out on Laura's coffee table. We picked at everything-there was some poke for healthy food, then we nibbled on fried chicken and dipped it in the sauces. Then it was a bite of pizza and then popcorn and so it went. We ended up lying back on the couch upside down yelling at the tv as we were watching it. "This food is like a car crash, like the show really," quipped Laura. "This popcorn is delicious and full of cheap nuts as let’s face it there wasn’t many expensive ones, if any, on this show! It’s very hard to find a macadamia in that bunch!" she said and we both agreed that this popcorn would be called a "hot mess" just like the show! So tell me Dear Reader, do you make specific tv watching snacks? Did you watch MAFS and if so who were your favourites and least favourites? Step 1 - Place the popping corn in a paper bag and fold over 3-4 times. Pop on high for 2 minutes. Discard the unpopped kernels. Preheat oven to 120C/240F and line 2 trays with parchment. Step 2 - Heat the sugar, butter and maple syrup in a saucepan and allow the butter to melt. Then increase heat and allow the mixture to reach 140C/284F. 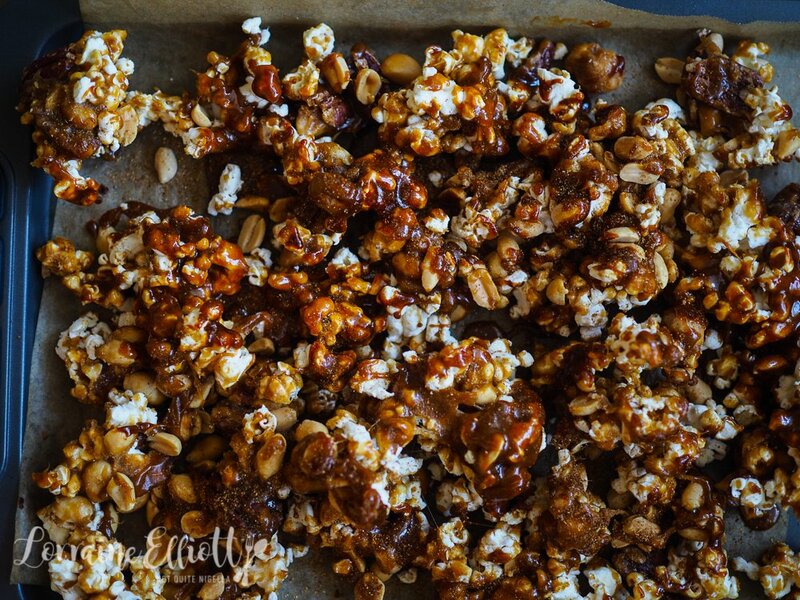 Add the salt and bicarb and stir and then mix with the popcorn and nuts coating them well with the caramel. Season with cayenne pepper to taste. Step 3 - Using tongs or two spatulas (the caramel is hot so don't touch it with your bare hands), spread out onto the prepared trays and bake for 1 hour. Break up into smaller pieces and store in an airtight container. 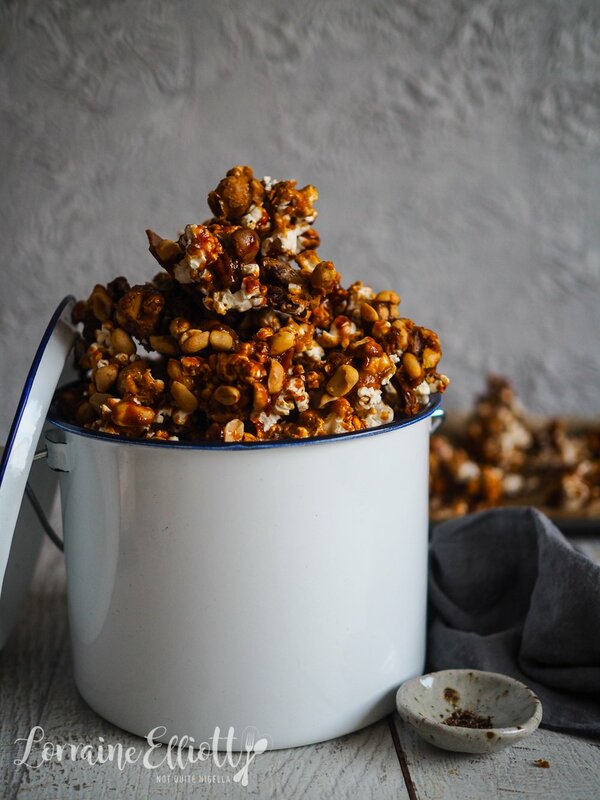 featureNutty Caramel Popcorn - Better Then Bought! 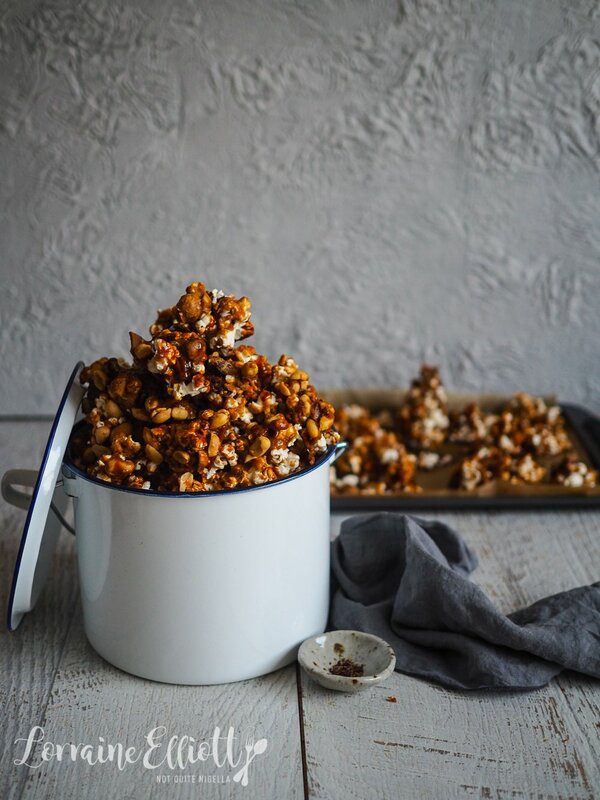 recipeSwallow the Evidence: Halloween Evidence Bag Popcorn! 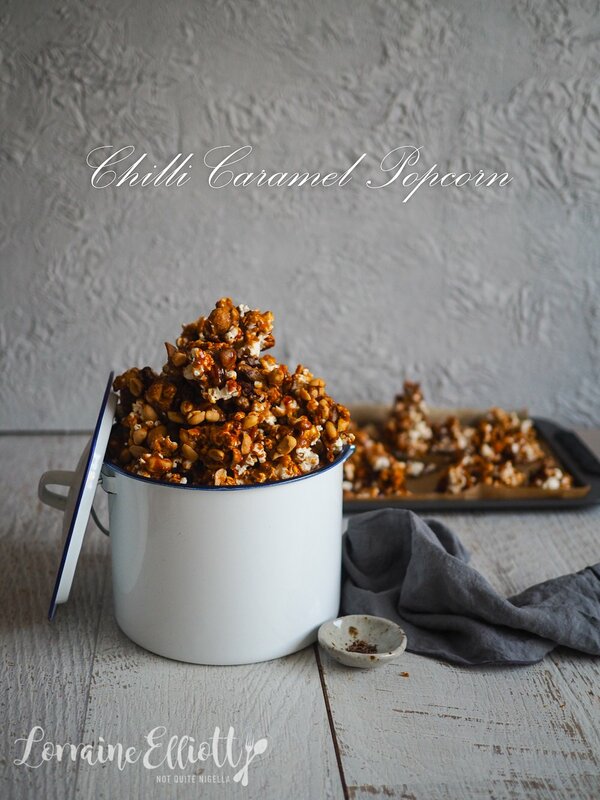 feature Nutty Caramel Popcorn - Better Then Bought! recipe Swallow the Evidence: Halloween Evidence Bag Popcorn!